Harmonics-Group Nuremberg 2014 | Harmonik Zentrum Deutschland e.V. Since Uta Hügerich could not participate, the second part of her presentation on “The intervals – seen from the perspective of a half-blown” was postponed to the next meeting. Instead, Willibald Limbrunner gave a presentation on mathematical and geometric relationships between the intervals of the diatonic and chromatic scales. He first showed how the tonal body of the diatonic scale in a two-dimensional representation can be easily reduced to the ratios of 2: 3 and 4: 5. He also referred to the connection between the interval groups used in ancient times, called tetrachord, and the Tetraktys, which was in the ancient Greek culture of high symbolic importance (see the Internet “Tetraktys”). 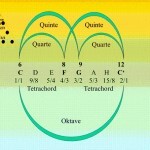 It is shown how this Tetractys is related to the intervals of the diatonic scale and the intervals of the Tetrachord. Afterwards Georg Fickenscher spoke about his ideas of a spiritually experienced harmony. In this context, he and Alexander Gollwitzer then performed three clay experiments, which are meant to be understood as “finger exercises” on the way to an intensively experienced harmony. These clay experiments are being further developed. The result will be demonstrated at the next Harmonic afternoon. Everyone present thought that the symposium was very successful. 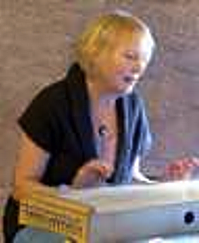 A special highlight was the appearance of Ms. Christina Baudenbacher with her monochord (see the video on the report on the symposium) This, as well as the presentation of Alexander Gollwitzer, made made clear how much harmonica understanding depends on the personal experience. – its registration at the register court in Nuremberg was made via the notary. – a new account has been set up at the “United Raiffeisen Banks Nuremberg”, through which all financial transactions of the association will be processed in the future. assciation. This discussion will be further developed at the next meeting. Hans G. Weidinger presents “What harmony means”. His idea is that there is a principle of exchange between information from the outside world and reactions of an inner world that exists down to the smallest and simplest forms of life. Harmonics is then the bridge between these worlds of “outside” and “inside”. A realization of this bridge to a holistic world-life is then synonymous with the conscious perception of the living exchange between these two worlds. This presentation was so well received this afternoon that the author feels encouraged to pursue this idea in a sustainable way. As a first consequence the text will be incorporated in our of this WEB appearance under the main site “Harmonics today”. The presentation “What Harmony means” can be downloaded HERE as pdf-file. 1. A so-called body monochord. She also participated in the symposium in May this year. Thus she can put whole soundscapes. 2. A Kotamo monochord on which she could adjust different tone scales, such as to be used in Japan or in Egypt. 3. A third monochord with only a few pages. All three monochords were tuned to the base note a. Already in this process she took us inside. And then she first played and sang with the big body monochord, much as she did at the symposium. And with that she took us completely into her world, the direct physical perception of the harmonic sounds. Next, with the Kotamo Monochord, she first took us on a journey into the sound worlds of Japan, and then of Egypt. The special thing about it was that when changing from Japan to Egypt she only had to change the first step in the tone scale. And then she distributed her monochords among us, so that everyone could gain experience with it. The highlight of this afternoon was a kind of harmonious retreat. She sent us all together into a silence break to the inner collection. From there, she then opened us for her game on the big body monochord. Finally, she distributed the monochords to us again. But this time for a common harmonic sound experience, in which everyone, who had a monochord in their hands, actively participated. We were all caught up in a hitherto unexperienced world. All in all, a unique afternoon, the experience of which will be with them for many years to come. We are happy about this wonderful cooperation.